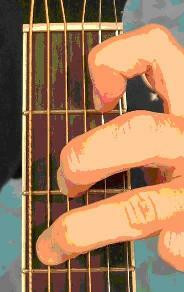 Learning all 5 positions of the minor pentatonic scale is not required to learn how to solo. Using just a few notes from the scale is more than enough. In the beginning, you should concentrate on just using a few notes, for example the 1st scale shape, or the top 5 notes of the 2nd position minor pentatonic. Now learning to solo is not just a matter of knowing the shapes and notes. Timing is very very important, as are the vibratos, slides and bends. That adds the style. Becoming familiar with guitar tab notation is an important step in becoming a guitarist. If you just want to learn and strum a couple of chords, than you won't need to know how to decipher tablature. BUT if you want to be able to play as many songs as you like, you will definitely need to learn how to read guitar tabs. First of all, you need to know that reading tabs is very easy. It may seem complicated at first, but with just a little practice, you'll be able to effectively read guitar tablature, which is great, since you can download loads of tabs off of the Internet, not to mention the fact that our own Guitar Pro tabs database uses tabs as well. Tom, what's the easiest way to learn guitar? So, my young Padawans, let's have a look at this question in detail. 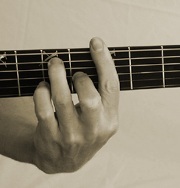 Can learning guitar be easy? If you are looking for an easy way to learn to play guitar in 10 days, you just got to stop and ask yourself a few things. Can I really build a complex skill in a week? And if I could, wouldn't everyone be playing guitar like Slash? Don't be silly now. There is no pill you take and wake up the next day and become awesome at guitar. Are you looking for a quick and simple way to learn chords, scales, and whatnot? Well, sorry, but there isn't any. You have to work for it, and it will take a while. Guitar stars like Eric Clapton, Slash, BB King make it look so easy, right. Yeah, but they've been playing for decades. How long have you been playing?